A SHARPER FOCUS ON THE BIGGER PICTURE When it comes to weight loss, the focus is on the body--what you eat and how you workout. While both of these are important for weight loss, if you take a step back, you’ll notice there’s more to it. THE FORMULA FOR RESULTS: THE BODY + THE MIND SuperHD has a multi-dimensional formula with ingredients to help you look and feel your best. Weight loss involves the body and the mind. You don’t just love how you look when you lose weight, you also love how you feel. Put each of these together and you’ve got a ‘feel good’ weight loss product. A 360° VIEW OF SUPERHD Powerful Nootropics High-Powered Energy Helps Promote Fat Loss Helps Increase Fat Metabolism Helps Promote Better Appetite Control SUPERHD THERMOSCULPTING™ BLEND KEY INGREDIENTS: Slimpro® is a key ingredient in Cellucor’s Fourth Generation SuperHD. It is a naturally derived ingredient that helps the body trigger the feeling of satiety to control appetite. Green Tea is known as a natural metabolism booster to support fat loss efforts. SUPERHD SENSORY IMPACT™ BLEND KEY INGREDIENTS: Amla Fruit Extract, also known as Indian Gooseberry, contains several active compounds that support mental energy and memory. Toothed Clubmoss is a natural source of Huperzine A, an active compound that may help support memory, and concentration. Q.1 What is Cellucor Super HD Weight Loss? Cellucor Super HD Weight Loss is a Stimulant Fat burner which aids in Fat-loss as well as increases alertness and focus. Caffeine is one of the most researched substances reported to help athletes perform better and train longer and harder. It increases alertness and focus during workout. Q.3 Why Green Tea Leaf Extract? Green tea contains bioactive substances like caffeine and EGCG, which can have powerful effects on metabolism. Compounds in green tea increase levels of hormones that break down fat cells and makes it available for energy in bloodstream. Slimpro® is a key ingredient in Cellucor's Fourth Generation SuperHD. It is a naturally derived ingredient that helps the body triggers the feeling of satiety to control appetite. Q.5 How to use Cellucor Super HD Weight Loss? Take one serving (1 capsule ) of ‘ Cellucor Super HD Weight Loss’ with 8-12 fl. Oz. of water in the morning, and one serving (1 capsule) with 8-12 fl. Oz. of water 5-6 hours later in the mid-afternoon. Once tolerance has been assessed, if you are looking for an additional boost of energy, an additional capsule may be taken with your first serving of the day. Do not take this product within 6 hours of bedtime. DO NOT EXCEED 3 CAPSULES PER DAY. USE ONLY AS DIRECTED. Q.6 Is Cellucor Super HD Weight Loss 60 Capsules a vegetarian product or a non-vegetarian product? 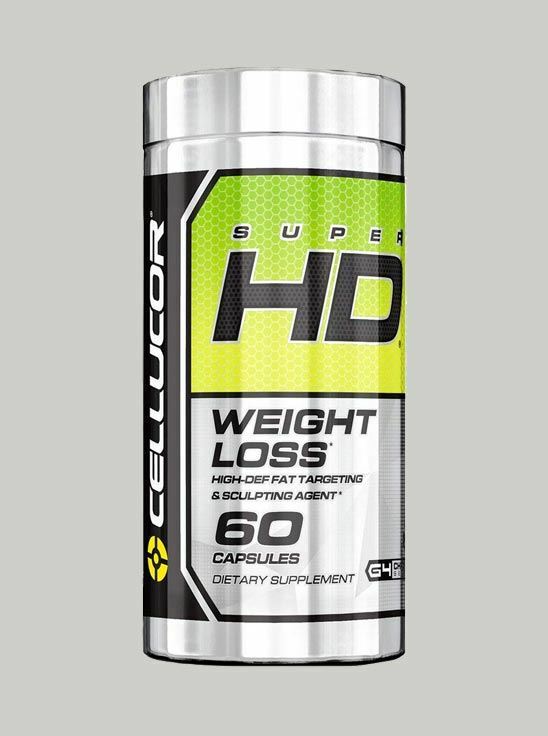 Q.7 Will Cellucor Super HD Weight Loss 60 Capsules be effective in fat loss without following any diet or exercise? No, along with Cellucor Super HD Weight Loss 60 Capsules it is recommended to follow proper diet and workout regime.